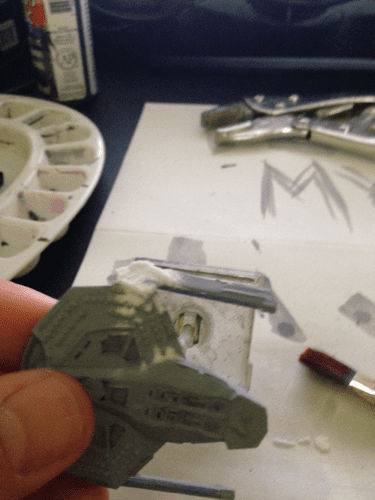 Subject: Quick and Dirty Miniature Painting Tricks. 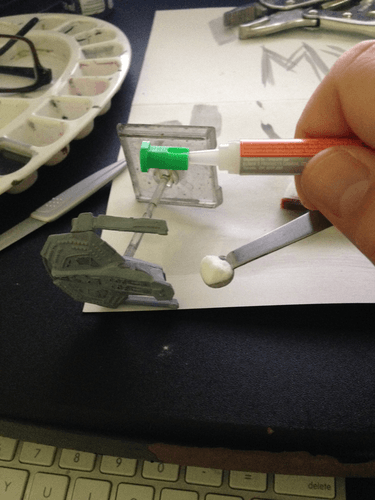 Here's a trick I use because I am not what you'd call a miniature painting guru. 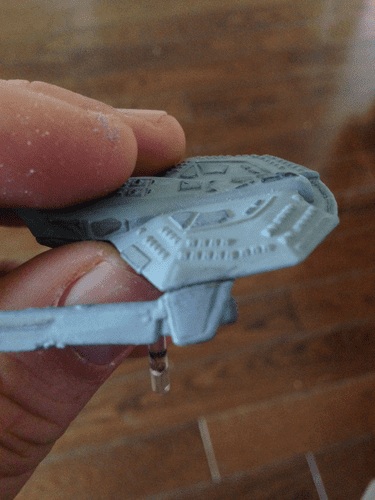 I am not even the neighbor of a friend of a guru, I am just a lazy dude who enjoys painting his miniatures. The trick is using Krazy-Glue™ and Baking Soda to fill in gaps as an instant sort of spackle. The actual part where you do something. I could have made a video of me running a careful bead of glue along the seam, but given how fast the glue dries, I had to choose between filming or doing the fix. I chose to film, but after a few minutes I realized that unless I did the fix there was really nothing to film, so I switched, and ran the bead of glue then dumped the Baking soda on it while it was still wet. This is a picture of how that should look after you do that. I didn't bother taking a picture of what the tapped down baking soda looked like, but try to imagine the above pile tapped down a bit, and you'll pretty much have it. Seriously, when you do your own you can stare at it for a while if that's what gets you through the night. When you're done you'll probably have to sand it down, or if you're lazy like me - just use your wife's nail file. Tell her about it before you do - BELIEVE ME, you don't want to be caught in the act of using it without getting permission first. The point is, this is a quick and dirty fix. If you're a big time operation, you can go out and buy the good stuff that's made for this, and get all the fancy little tools and stuff. Hmm (thinking) I would like those tools actually, but I digress. But if you're in the middle of painting, like I was, and struck suddenly by how ugly the model looks with this massive joint where none should, or if you need to fill in a defect or what have you - and you have some Krazy-Glue™ and Baking Soda around (and a nail file), and you've settled the matter in your heart that you're not in fact working on a piece of art worthy of better materials - then go for it, this is a very quick, very simple fix. I would suggest the liquid green stuff as well. It's cheap, easy to use, and easy to find. 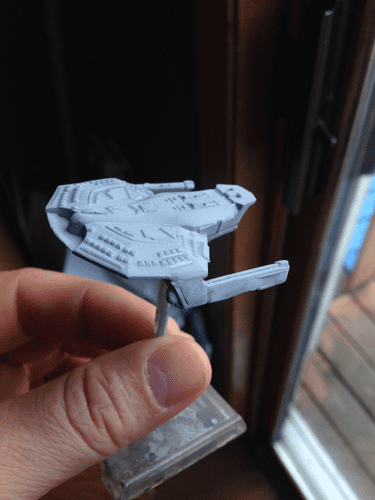 The reason this post was included the words "Quick and Dirty" in the title was in anticipation that the general audience would not be LGS savvy, or alternately would not have any on hand. That's what makes it quick and dirty. LGS is fine if you have some - but if not, and the fix is minimal like this - most of us have Krazy-Glue™ on hand, and can affect this patch in five minutes or less. I am saving the LGS stuff for a follow post, "The tried and true products you can buy to do the job without having to resort to any sort of quick and dirty solution!" Nicely done! That's a trick I never would have considered. I do have liquid green stuff, but I'm going to give this a shot on one of my minis at some point to compare. Very nice...gave me a reason to update Collected Expansion Threads for Attack Wing (aka Pimp your AW) again. Added a new "Prepping" section.